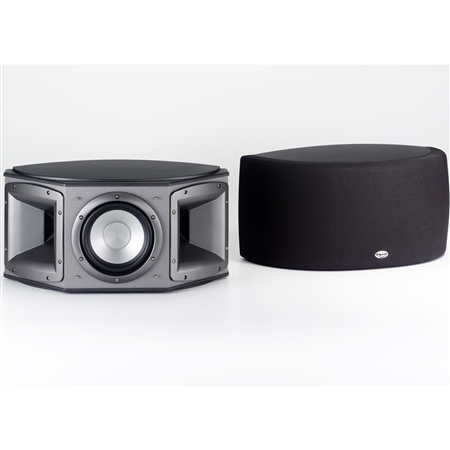 This third generation Synergy surround speaker also benefits from more than 55 years of Klipsch engineering experience and aesthetic upgrades that are representative of a new quality of craftsmanship. The S-3 delivers crystal-clear sonic detail through the careful placement of two Tractrix® Horn loaded aluminum-dome tweeters and one 6.5-inch IMG woofer. By aligning the two horns at 90 degrees with respect to each other along with the front-firing woofer the S-3 smoothly covers a 180-degree horizontal arc allowing maximum placement flexibility. Available in a black finish with titanium accents the contemporary look of the S-3 is two-fold. With its grille on the S-3 offers a sense of elegance that nicely blends in with your home décor but take the grille off and you get an aggressive and powerful statement that exudes extreme performance. Equally adept to establishing enveloping ambient sound fields and localizing specific surround effects the S-3 WDST surround delivers the full impact of special effects resulting in the ultimate you-are-there experience. While no longer in production the S-3 is still owned and listened to by Klipsch fans around the world. To connect with other people who are passionate about audio and interested in Klipsch products visit our open forum bulletin board.